This game may not be as simple to dissect as it first appears. Sure, it’s an undefeated team against a 3-6 team. However, rest assured that Mill Valley isn’t expecting an easy victory. Aquinas plays in an extremely competitive Eastern Kansas League and despite strong regular season records every year, the Jaguars haven’t made it past the first round of the playoffs since 2008. 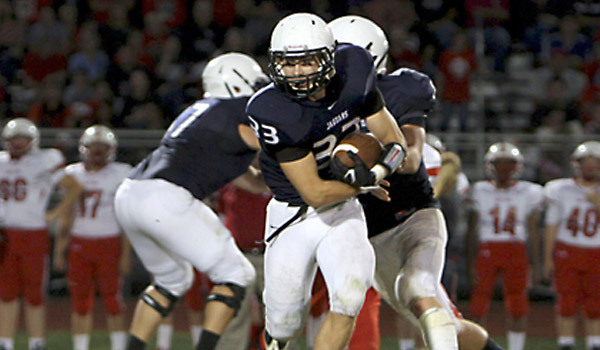 But this season may be different for Mill Valley. The Jaguars are undefeated and opened the season with an impressive 26-21 victory against 6A’s Manhattan. They have allowed the fewest points among all Class 5A teams. Sophomore Logan Koch ran for 281 yards and six touchdowns during last week’s 68-8 rout against Lansing. Aquinas opened the season with an 0-4 record, but the Saints have bounced back to win three of their past five. Quarterback Danten Cosentino passed for 297 yards and a touchdown in last week’s 50-16 loss to Bishop Miege. KC Turner is the only like opponent for Mill Valley and Aquinas, and both teams won by large margins. Blue Valley visits Shawnee Heights in a rematch of a great first-round game from a season ago. Last year, the Tigers intercepted a T-Birds pass late and scored in the final minute to edge the Thunderbirds 17-10. Logan Brettell hit Mikey Henson on a 20-yard strike to provide the winning points in that game. Bretten and Henson are back this season to lead a Tiger offense that averages nearly 33 points per game. Brettell has passed for nearly 1,200 yards and 12 touchdowns, while Henson has nearly 500 receiving yards and eight scores. Chance Nelson leads the Blue Valley rushing offense with 1,265 yards and 14 touchdowns, while Montana Brady has complimented him with nearly 550 yards on the ground. The Tiger defense is arguably the team’s strength allowing less than 15 points per game. Illinois commit Henry McGrew (6-3, 240) leads the Tiger defense from his linebacker position. Shawnee Heights has won three straight games since struggling to a 1-5 start in the Centennial League. Quarterback Taymon Grabauskas leads the T-Bird offense in passing for 1,673 yards and 14 touchdowns. Colton Kennedy and Austen Hubert are his main two receiving targets with 668 and 604 yards, respectively. Tony Barksdale leads Heights with 632 yards rushing and 12 touchdowns. Three of the T-Birds losses have come by ten points or less to quality teams in Junction City, Topeka High, and Washburn Rural. This one should be closer than the records indicate, but give the Tigers the edge. After back-to-back losses, Salina South has rolled with six straight victories and scored at least 40 points in each victory. The Cougars’ 408 points ranks No. 1 in Class 5A, and the team has played the No. 4 strength of schedule. The Cougars have a balanced attack with 164 passing yards and 294 rushing yards per game. Senior quarterback Justin Stonebraker has completed 72 of 115 passes for 1,340 yards with a 20/4 TD/INT ratio. Senior running back Mike Jones has rushed 162 times for 1,294 yards and 23 TDs. Former Wichita West coach Weston Schartz has done an outstanding job in his return to West. The Pioneers are back in the playoffs and have its first winning season for the first time since 2002. In a 48-24 playoff-cliching victory against Arkansas City last Friday, DJ Jones (248 yards, five scores) and Tre’von Mitchell (192 yards, one TD) enjoyed big games. West also has some close losses, including at Bishop Carroll (20-10), at Kapaun-Mt. Carmel (14-13). West has had a great run, but it ends here with a loss. Kapaun has enjoyed a five-win improvement from last season and is back in the playoffs for the first time in seven years. The Crusaders’ season included a district-clinching 40-35 victory against Andover Central last Friday. Ethan Harp recorded a 35-yard interception return for a score and collected 141 rushing yards. Quarterback Brock Monty had another big game when he completed 13 of 17 passes for 145 yards with a touchdown and an interception and rushed 15 times for 84 yards. Among Kansas’ top-25 11-man offenses, Liberal is easily No. 1 at 71.4 plays per game, nearly 10 plays ahead of any other squad. Senior quarterback Britton Abbott has completed 186 of 333 passes for 2,673 yards and an 28/8 TD/INT ratio, and has rushed 192 times for 1,145 yards and 10 scores. Senior wideout Trenton Hammond has 72 catches for 1,384 yards and 11 scores. Liberal has 364 points, fourth-best in the classification, but has allowed 354 points. Liberal can score with anyone, but has some big question marks defensively. The Redskins haven’t made the playoffs since 2009 or won a playoff game since 2004.